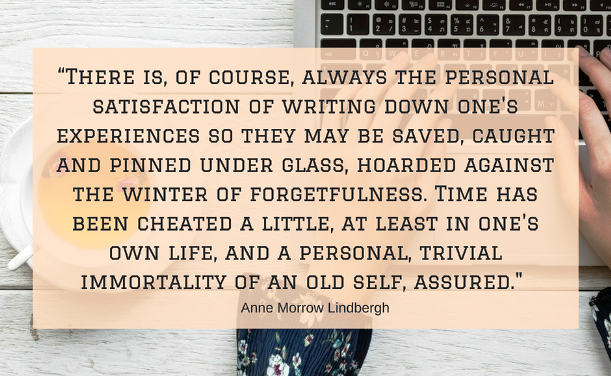 Last week I mentioned that I was feeling inspired by the writings of Anne Morrow Lindbergh and what she had to say on several different areas of life. The first was her views on Midlife and today I wanted to look at some of the thoughts she has on writing - which transfers across beautifully to why many of us blog. A lot of writers blog and a lot of bloggers write - it seems to come with the territory. For some strange reason there are also bloggers (like myself) who have no notion of longing to have a novel published. I love the shortness and the immediacy of writing a blog post, an idea comes and I write it down, the process can take 30 mins to an hour for me and it often takes me longer to find images and format everything than it does to write the post itself. I can't imagine spending months or years writing, re-writing and editing my thoughts into a book - way out of my comfort zone! What writing a blog post, or a journal entry, or a book does, is give substance to what we have in our minds. It lets the thought out of our head and as we put it together on "paper" so to speak, it gives it a legitimacy that it may never have received if it was a transient thought that never made the light of day. I've found that the more I write about the joys of Midlife, the more joyful Midlife becomes. The more I write about the blessings and the benefits of being 50+ the more they become part of my conscious belief system and the more likely they are to become part of my day to day life. To quote Buddha - "What we think, we become." I want to manifest what I believe - walk my talk, live out the grace of God, share kindness and laughter, connect and encourage. Writing about that makes it more real and helps me to live it outside of the written word. One of the first "blogging rules" is to write for your reader, but for me it's more about writing what's in my head and in my heart. I love writing out my thoughts, putting my experiences down somewhere and giving them a life of their own. Creating memories to look back on, stories that I can re-read in later years and reflect over. If it resonates with others then that is an added blessing, but it's not my prime purpose for blogging. Journalling does that for me too, it's a little snapshot of my life each week - I can look back at the highlights of my life and remember them again and again. There are milestones and crises that I can read over again years later and see how much further down the road I've come. The quote "this too shall pass" becomes more relevant when I look back at awful times that I thought would defeat me, or break my heart - and I see that I've weathered the storm, grown stronger and continued to move forward. Without a journal it wouldn't be as real. One of the greatest joys of blogging has been to connect with so many people all over the world. Women who are experiencing Midlife on their own terms and thriving as they navigate their 50's, 60'S and 70's. We share stories, we talk about our lives, our families, our work, our dreams, our travels, and so many other elements of life. As we connect through reading the writing of others or commenting on their posts, we create a tribe and sisterhood that we'd never have experienced without the common denominator of our blogs. Blogging in a way has taken over the role of writing letters to distant friends. We write to our "pen pals" and they write to us - we know each other's stories and we experience snippets of each other's lives. We'd never have known each other over the vastness of distance if it wasn't for the posts we write each week. We tell our stories and connect through them. 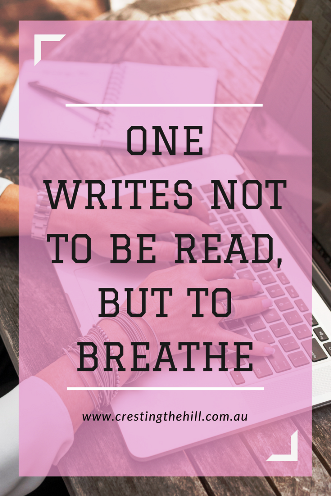 Do you write to breathe or to be read? Do you write to share your life stories and to engage with others? Or do you write for a completely different reason? I'd love to know what drives you to blog every week. You're so right Min - the actual act of putting our thoughts down in a concrete way seems to clarify things and for me it's been a really positive and enriching experience. I'm coming up to four years of blogging - who knows if I'll get to six, but regardless it's been immeasurably wonderful - and the friendships are definitely the icing on the cake! I really enjoyed this post, Leanne. I especially liked your line, "I've found that the more I write about the joys of Midlife, the more joyful Midlife becomes." I believe that this is true in so many ways and on so many levels. What we focus upon becomes our reality. Writing is an incredible tool to help us do this. Thank you for sharing this. Hi Donna - it's such a truth for me that writing and interacting with other Midlife bloggers has been the saving grace of my 50's. I think I would have just faded into the woodwork and accepted the whole "invisible woman" thing if I hadn't been able to flesh out my thoughts and have the interactions with other positive women. Blogging has definitely been a salvation for me. lovely post. I wrote for a number of reasons - to tell a story through my novels, to record my photos and journal my travels, and I keep a manual journal for jottings, travel diaries etc. I love how it focuses me. I only have my blogging and my manual journal Jo - they fulfil different roles, but I love them both. It's such a joy to put my thoughts down somewhere and to look back at all that's been written and to know that it has my truth embedded in it. I love that quote and I write to breathe! I'd keep writing even if no one read it. I think I've always done that since a young age. It gives voice to my feelings and my thoughts. I'm the same Sanch - I never thought anyone would read what I wrote, the fact that people do, and that they take the time to comment and interact, has been such a blessing to me and really reinforced the power of the written word. I really enjoyed this post Leanne, not surprising really as I seem to like reading all your posts!! You write what I'm thinking so often :) I write to breathe I think, I share stories and love to engage with others like yourself. 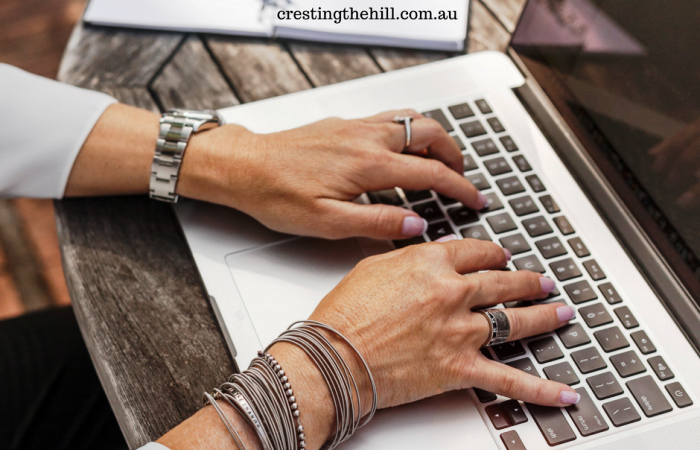 Blogging gives me a sense of accomplishment and creativity and ow that I'm retired it gives me a focus. I just love it!! I love it too Deb - the joy of writing something that puts what's in my heart into perspective, meeting other bloggers, finding commonalities, reading and learning, laughing and sharing our lives - what's not to love? I think I started with a different focus too Kathy - somewhere to try to order my thoughts, to share my ideas and to make sense of my life. It's morphed into sharing things I'm learning, making friends, writing for the pleasure of it, and I have a quiet sense of pride in all that I've put down over the last few years. It's wonderful isn't it? Love it, Leanne! I blog to connect with women around my age and to share things we might be going through at similar points in life. Many times we hold things inside and feel alone thinking that something is wrong with us because we think, feel or are experiencing something no one else is experiencing. Guess what? We are all in this age thing together! Blogging allows me to release my creative expression as well as share common thoughts others may be holding inside and need a connection to feel relief. I do have the desire to become published as a humorous womens fiction author, so many stories in my mind with unique characters! It will be a while, but I want to leave this earth with an ISBN number so that I can always be found at the library, LOL. I've found the same connections with blogging too Lori Jo - the friendships and the sense that we're all on this Midlife journey together - maybe doing it a little differently at times, but with a common thread of wanting to make the most of what we've been given. I'll be interested to see your new blog format and also to read some of these stories when you get around to putting them down somewhere to be read. Maybe you'll become famous and I'll be able to say I knew you "way back when..."
I write to tell stories. They bubble around in my head and have to come out! And by telling them, the people from my past come vividly to life once more. Such a great post to think about Leanne. As an avid reader, I always thought I'd love to write someday. But the more I do it, the more I realize it's just not my thing. If only I could post the photos of our outfits and not have to say anything....although I do love talking about the clothes and how they go together. It's nice to see that I'm not the only blogger who doesn't have a myriad of characters running around in their heads just waiting to leap onto the page Jodie! I always enjoy your take on the outfits you photograph - it wouldn't be the same without the narration! I think the pen-pal analogy works so well for blogging Suzanne - we share our stories and we love that others are interested enough to write back :) I think putting my thoughts down in my blog over the years has really clarified things for me and helped me through this Midlife journey with a much more positive mindset than I'd have had without it. For me, blogging is like having a conversation. I tend to write about what's on my mind for that day/week and try and make it cogent enough for others to relate. Great post. I'm a bit the same Laurie - there are so many little thoughts that I have during the week or month that find their way onto my blog. When someone says that they totally get it and give me their take on what I've been mulling over, it just takes it all to a new level. I write for pleasure, Leanne. I didn't read any blogging rules and might have violated some inadvertently :) When people read and leave comments on my blog then it becomes sharing stories. Thanks for sharing this. I couldn't believe all the blogging rules I've stumbled upon over the years Natalie - and how most of them just leave me cold. I tossed them all out and write for pleasure too, if you're not enjoying the writing, the story telling, the interaction, and the comments, then why would you bother? Yes, this is something I've thought a lot about as well Leanne. I love words and phrases. I love reading. I love writing. But it's also cathartic and I feel better once I've written something. I'm an avid talker (chatterbox) but sometimes I find it much easier to write about my feelings than to speak about them. I feel the same way Deb - it's an outlet for me. Initially it gave me somewhere to put my thoughts down when they weren't particularly happy, but as time's gone along I've just found so much joy in the writing and the engagement. When I look back at how far I've come I sometimes just stop and smile for a moment and wonder why I didn't start years before I did! Leanne, thank you for these beautiful and motivating words. Your post title is so inspiring and true for me when I get the words and pictures just right. The challenge for me is getting back into that zone after falling off the wagon now and then. 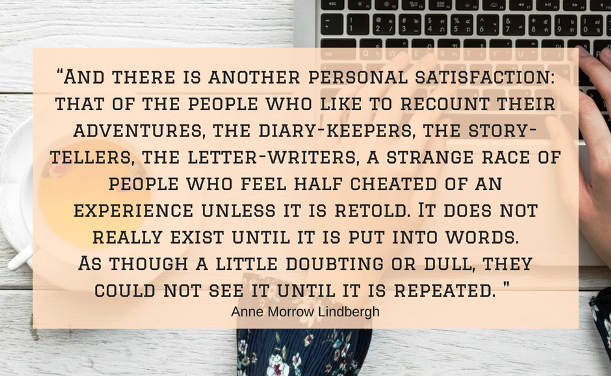 I'm just really enjoying Anne Morrow Lindbergh's writings SSG - and what she says resonates with me in the whole area of blogging and journalling - it's why we do what we do isn't it? I started writing after my sister died and I still keep a journal. I am not much of a writer but still like to blog. I'm much the same - I don't feel the slightest inclination to write (and sell!) a novel, but tonking away on my blog or noting thoughts in a journal just seems to answer something inside me. You captured beautifully many of the reasons I write, Leanne. It's so interesting that writing about joy seems to expand it, and writing about our sorrow seems to dissipate it. What a lovely thing. Whether you write for yourself or for us, just keep on doing it! I love seeing what you have to say. Thanks for your kind words Christie - I may never come close to writing a novel (and when I read about all the background stuff, I run in the other direction!) but I do love writing my thoughts down and I also get so much joy from the friendships that have come my way through this blogging adventure. I began blogging in 2009 with no intention of professional writing. In 2014 I took writing classes to improve my writing to better my blog...and soon began submitting ideas to magazines. Now I have five nonfiction children's books published. I have my first big contract for a middle grade book which will be out in 2020. (The others were work-for-hire books...about a two month project.) I LOVE WRITING! Leanne - thanks for a beautiful post. I've been writing in some shape or form all of my life. Some very private, some for public consumption. I'd have to say I write to breathe and to be read. Whereas many writers are introverts - I'm very much an extrovert and enjoy the interaction that blogging provides. And as I mentioned in the comment to Annette above -- I hope to be her when I grow up -- an author with several books under my belt and 'pending contracts'...Thanks for another thought provoking post! I blog for a lot of the same reasons. It gives me a chance to express my thoughts, vent my feelings, share my story and help others. Visiting form #BloggersPitStop. 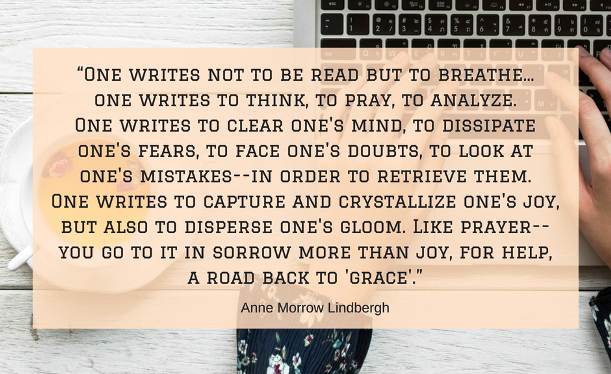 I'm really enjoying Anne Morrow Lindbergh Janet - she has such a way of writing that I just seem to identify with on many levels - glad you enjoyed her too.